Although shade may be more important when fishing deep, clear, reservoirs, many anglers are finding out that shade can be a key area when fishing for summer bass in shallow areas and in smaller waters. The rays of the summer sun will often reposition the bass as they relate to cover. Anglers have found that if they key in on the areas where the sun shining through cover where a shadow is cast that is where the fish will be positioned. The angle of the sun in relation to the object provides a pocket of shade or cover for the bass to wait in ambush for unsuspecting prey, and the bass ?have it made in the shade?. Summer anglers search for locations where trees meet deep water along steep banks of ponds and lakes. Deep shaded areas with some cover can be very productive during the summer months. These deep dark banks provide quick access to and from deep water and the cover bass use for feeding. Laydowns and overhangs enhance the attraction of the bass to the area. In these areas soft plastic baits thrive. 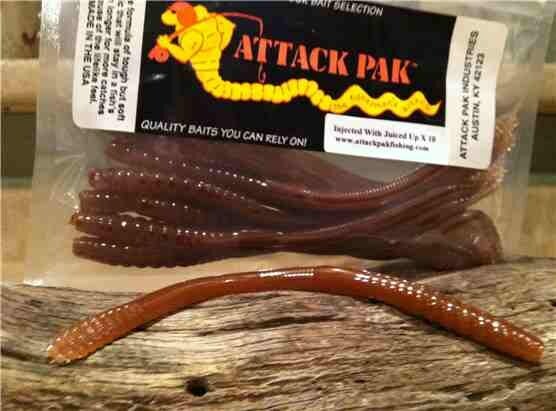 Fishing with quality baits like Attack Pak Fishing?s soft plastic worms, grubs and jerkbaits, cast to the bank can be a game changer. Texas Rigged, Wacky Rigged, with or without weight, Carolina Rigged, or on a drop shot, in the summer heat soft plastics in shade can produce fish when nothing else will. The Attack Pak soft plastics are enhanced with ?Juiced Up Baits? patented scent attractant that actually triggers the need to feed in the bass. The warm water of summer speeds the metabolism of the bass, which in turn speeds up their digestion process, and with a little natural help, the scent in these baits turns on the bite. Science and biology teamed up with attractive bait can?t be passed up by bass. By casting a weightless six inch trick worm, a five inch salty sinking worm rigged wacky style or a flipping shad (soft jerk bait) rigged Texas Style, into the shadows and allow it to flutter down along deep bank through the cover can be exciting. If a strike isn?t immediate on the initial fall anglers give the rod a light twitch, and slowly, gently reel in the slack line. Bass will often engulf the bait as it is fluttering down. Attack Pak provides anglers with the dark colored needed for fishing the shade in their baits, such as those in watermelon, green pumpkin, black and blue flake, smoked copper and smoked glitter. It is important to avoid bright colors when fishing shaded areas. Other than a weightless presentation in cover on deep, shaded banks, bottom fishing in these areas with weighted soft plastics can be just as successful. Attack Pak also offers a four inch crayfish, six inch lizards or the flipping shad that can be fished on weighted hooks, Carolina rigs. Available in the same dark colors needed for the shaded areas. They also have awesome three and a half inch curly tailed grubs that can be put onto a jig head and fished slowly through the shaded depths. When the shade bite is on timing and location of shaded areas is important. Patterning the shade as the day progresses can require a bit of planning on the anglers part. As the sun comes up many anglers will choose a long bank that they can fish in the shaded areas for several hours. By following the angle of the sun they follow the shade lines. Once they have found the shaded areas, the prime ambush points are then targeted. In these shaded areas where the bass will be positioned, the edges of the shadows are then targeted by the anglers. Just like the spring when bass use the area where clouded water meets clear water, they will use a shadow to conceal them for ambush. This summer pattern of fishing the shade can be a great way to make the most of your time on the water. A great technique and good confidence baits such as Attack Pak, can give an angler what he needs to have it made in the shade. For daily bass fishing tips, and other fishing related topics, be sure to subscribe to my public updates on Facebook!